Is the Hamilton® CapTel® App compatible with all iPhone versions? Is there a charge for the Hamilton CapTel App? Where can I obtain the Hamilton CapTel App? Is there a live captioning assistant on the call while I place and receive my captioned telephone calls? I don’t have a Hamilton CapTel Account, do I need to register? Why am I required to register my Date of Birth and the last four (4) digits of my Social Security number? What does Hamilton do with my information when I submit my registration? I already have a Hamilton CapTel user account. Can I use the same username/password for the Hamilton CapTel App? Can I use my Hamilton CapTel account on my iPhone and a Tablet? How do I place a call with the Hamilton CapTel App? Can I add my extension to the “My Phone Number” box in the “Options” tab? Can I dial a number with an extension or access options on interactive voice recording menus? Can I place calls using my existing Contacts on my device? Can I place a call using Spanish with the Hamilton CapTel App? Can I receive a call with the Hamilton CapTel App? Is the Hamilton CapTel Call Me # available in U.S. Territories? I have a Hamilton CapTel Call Me #, can I use it on my iPhone? I have a Hamilton CapTel Call Me # on my iPhone. Why aren’t my calls coming through? I have a Hamilton CapTel Call Me # on my iPhone. If I use Hamilton CapTel on a PC/Mac, where will my calls be directed? I do not have a Hamilton CapTel Call Me #. What happens if I have “Receive Calls” turned “OFF” and someone tries to call me through the Hamilton CapTel App? If I obtain a Hamilton CapTel Call Me #, will people still be able to dial the toll-free number (855-318-8818) to reach me? I have a Hamilton CapTel Call Me #, but I’m not logged in on my iPhone. What happens when someone tries to call my Call Me #? How does Caller ID work with the Hamilton CapTel App for iPhone? Can I customize the font or background settings on the Hamilton CapTel App during a captioned call? Can I review the conversation (scroll up or down) while still on the call? Can I access the “Options” tab during a call? Can I save and review the captions of a conversation after the call has been disconnected? How do I delete saved calls from the Hamilton CapTel App? Can deleted calls be recovered? When I attempt to open the Hamilton CapTel App, it immediately quits or crashes. What can I do to make it work? Can I change my username or password within the Hamilton CapTel App? Can I place a 911 call with Hamilton CapTel? I’m experiencing difficulty connecting to Hamilton CapTel service. How do I know if there’s a service interruption occurring? The Hamilton CapTel App will work with the iPhone 5, 5S, 5C, 6, 6 Plus, 6S, 6S Plus, SE, 7, and 7 Plus running versions prior to iOS 11. We are working to support current versions of iOS – please contact Hamilton CapTel Customer Care if you have any questions about the compatibility of your current version with Hamilton CapTel. There is no charge for a Hamilton CapTel Account or for the Hamilton CapTel App. You can download the free Hamilton CapTel App on the Apple App Store when the updated version is available for iOS 11. Yes, a live Captioning Assistant (CA) generates captions of what's said to you during your call through the use of advanced voice recognition software. In order to use the service, you must register for a Hamilton CapTel Account. This one-time registration allows you to provide Hamilton with necessary information as well as certify that you have a hearing loss that necessitates the use of captioned telephone services. The FCC works to protect captioned telephone service from potential misuse by people who may not need captioning assistance. Your registration information confirms that you are at least 18 years of age, and are a U.S. citizen. All information provided is treated, by law, as confidential. All information gathered is secure and confidential in accordance with FCC requirements. Your information is not used for marketing or promotional purposes unless you have specifically opted-in to receive information from Hamilton CapTel. Yes. Once you download the Hamilton CapTel App, simply enter your Hamilton CapTel username and password and log in. You can then place and receive calls with the app and begin receiving captions immediately. 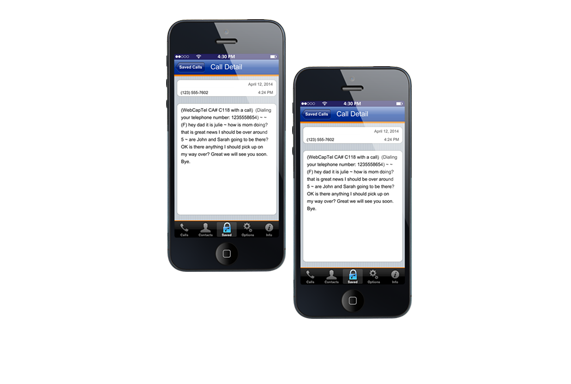 Yes, you can use your Hamilton CapTel account on your iPhone and a Tablet. However, if you have a Hamilton CapTel Call Me #. you will only be able to receive calls on one device, not both. Your calls will be routed to the last device used. From the Hamilton CapTel App call screen, enter the number of the person you wish to call in the “Number to Dial” box. To select a number directly from your iPhone’s contact list, simply click on “Contacts” at the bottom of the screen. Be sure that your headset is properly connected and ready to use. After placing the call, you will automatically be taken to the Captions screen where you will connect with the captioning service. Your iPhone will ring, notifying you that you have received a call from the Hamilton CapTel Call Center. Once you answer, the phone number of the person you wish to call will automatically dial. In order to start the application and begin viewing the captions of your conversation, you must press the “Home” button on your iPhone, followed by the “Hamilton CapTel App” button. When the person you are calling answers, you can listen to what is being said while reading the captions on the screen. If your call is answered by a message system, the message will be captioned and you will be able to leave your message accordingly. You can end your call at anytime by hanging up or clicking the “End Call” button. To save your conversation, simply click on “Save Call”. At this time, Hamilton CapTel does not allow extensions to be added to the phone number you're using with the service. You can enter the 10-digit number you would like to dial in the “Number to dial” field. When connected, you’ll be able to listen while reading captions of the instructions and use your phone to enter numbers when prompted. To access the keypad function of your phone, you will need to touch the green bar at the top of your phone. To return to the captions, click on the home button twice, then select the Hamilton CapTel App. Yes, you can select numbers to dial from your Contacts through the Hamilton CapTel App. Simply touch the “Contacts” tab within the app and you'll see your contacts there. Select a name/number of the person you would like to call and your call will be placed! Yes. Spanish captions are available on Hamilton CapTel from 7am to 11pm CT, 7 days a week. To enable Spanish captions, click on the “Espanol” button on the “Options” tab of the app. Yes. Receiving calls on the Hamilton CapTel App for iPhone with your Hamilton CapTel Call Me # is easy. The Hamilton CapTel Call Me # is a ten-digit phone number that anyone can use to call you directly. First, visit the “Options” tab in the Hamilton CapTel App. In the “My Phone Number” field, enter the phone number associated with the iPhone you are using, which can be updated at any time in between calls. Not sure you have a Call Me #? Simply go to the Hamilton CapTel App and open the “Options” tab. If the Hamilton Call Me # field has a ten-digit number, this is the number you can share with family, friends and businesses! If you do not see a number, you can log into your account on a PC/Mac and visit the “Receive Calls” section. After you’ve received your Hamilton CapTel Call Me #, all you have to do is open the Hamilton CapTel app on your iPhone and make sure that Receive Calls is set to ON. If you do not have a Hamilton CapTel Call Me #, you must first enter and save a phone number in the “Receive Calls” section in order to receive captions through Hamilton CapTel. The person calling you must first dial the Hamilton CapTel Call Center at 855-318-8818 and then enter your phone number, followed by the pound (#) sign. Please note that the Hamilton CapTel Call Me # is not available in any of the U.S. Territories, with the exception of Puerto Rico. The only U.S. Territory that the Call Me # is available in is Puerto Rico. The Call Me # is not available in the following U.S. Territories: American Samoa, Guam, United States Minor Outlying Islands, U.S. Virgin Island, and Northern Mariana Islands. If you are not able to obtain a Hamilton CapTel Call Me #, you can receive calls in a different manner. First, you must enter and save a phone number in the “Receive Calls” section in order to receive captions through Hamilton CapTel. The person calling you must first dial the Hamilton CapTel Call Center at 855-318-8818 and then enter your phone number, followed by the pound (#) sign. Yes you can! To find out if you already have a Call Me # associated with your iPhone, visit the “Options” tab. If you see a ten-digit number in the “Hamilton CapTel Call Me #” field, you’ve already registered for a number. If you don’t see a ten-digit number here, simply log into your account and visit the “Receive Calls” page. You may need to reset your session with Hamilton CapTel. To reset your connection, simply turn “Receive Calls” OFF. After a few seconds, turn “Receive Calls” back ON. This should do the trick. If problems persist, please contact our Customer Service representatives! If you log into Hamilton CapTel on a PC/Mac, your captioned calls will be directed to your PC/Mac and to the number that is entered in the “I’m at this number” field. Once you log out of your PC/Mac, your iPhone will start receiving captioned calls again. If you have a Hamilton CapTel Call Me #, the person you are calling will be able to view your Call Me # via Caller ID. If you do not have a Hamilton CapTel Call Me #, the person you are calling will be able to view the telephone number you are using to talk on the phone (the number you entered in the “My Telephone Number” field on the “Options” tab). At this time, it is not possible to change these features any time during a captioned call. It is recommended that you set your features prior to making and receiving calls. Yes, the scroll feature works at anytime during the call process. At this time, it is not possible to access the “Options” tab during the call. It is recommended that you set your call preferences prior to making and receiving calls. Yes. When the call ends, click on “Save Call” which is located on the upper right corner of the Outgoing Call page. This will automatically save the most recent conversation. To view saved conversations, click on the “Saved” icon from the menu and select the saved call you wish to review. You can delete saved calls in the “Saved” menu. Click on “Edit” in the upper right corner and select the saved call(s) you wish to delete. Select “Delete”, then select “Done”. No. Once the calls are deleted, they cannot be recovered. You will need to adjust the privacy feature of the contacts on your device. Simply open Settings > Privacy > Contacts and make sure that the button for Hamilton is turned “ON”. If you continue to have problems, please contact customer care. No. You can change your username/password by accessing your account with a web browser. Please refer to the Emergency Calling 911 Info for information on using Hamilton CapTel for emergency calls. Please visit the Service Notifications page for information about current service interruptions Hamilton CapTel may be experiencing. Disclaimer: Generally, Hamilton® CapTel® will work on iPhones® running the latest publicly available operating system. There may be older versions that are no longer supported and, in some instances, current versions that are not yet supported. Please contact Hamilton CapTel Customer Care if you have any questions about the compatibility of your current version with Hamilton CapTel. You must have an internet connection that supports simultaneous voice/data usage in order to receive captions. If you do not have a wireless network that supports simultaneous voice/data usage, or an active WiFi connection, you will not be able to receive captions. The technology behind receiving captions with Hamilton® CapTel® is similar to talking on the phone and browsing on the Internet at the same time. The voice plan allows you to speak to the person on the other end, while the captions are transmitted through the Internet or Data connection on your smartphone. If you have questions about using your voice plan and “browsing” the Internet at the same time, contact your wireless network provider directly. NOTE: Voice and data plans may be accessed when using Hamilton CapTel. Hamilton CapTel is not responsible for charges incurred with your wireless network for voice and data usage when using Hamilton CapTel. For usage concerns, contact your wireless network provider directly.